Our curriculum is designed to meet the needs of the children in our care. We have a strong focus on communication and language. Children in each room take part in daily singing and story times. Children’s language is developed through meaningful interactions with skilled practitioners and high quality play opportunities. High quality texts are used across the nursery, linked to children’s interests. Outdoor play is at the heart of our curriculum. Children have access to our outdoor areas throughout the day. Our practitioners plan a range of high quality play activities to cover all areas of the EYFS. Practitioners follow children’s interests using ‘in the moment planning’. Each child is set individual targets each half term on their play plan. A copy of each child's play plan is sent home each half term to enable parents and carers to work on the targets at home. Children in the Sky room are introduced to reading and writing through phase 1 phonics activities. When they are ready, they start Read, Write Inc. sessions where they begin linking letters to sounds. This helps to prepare them for school. Read, Write Inc. is the method used in many of the local schools where our children transition to. 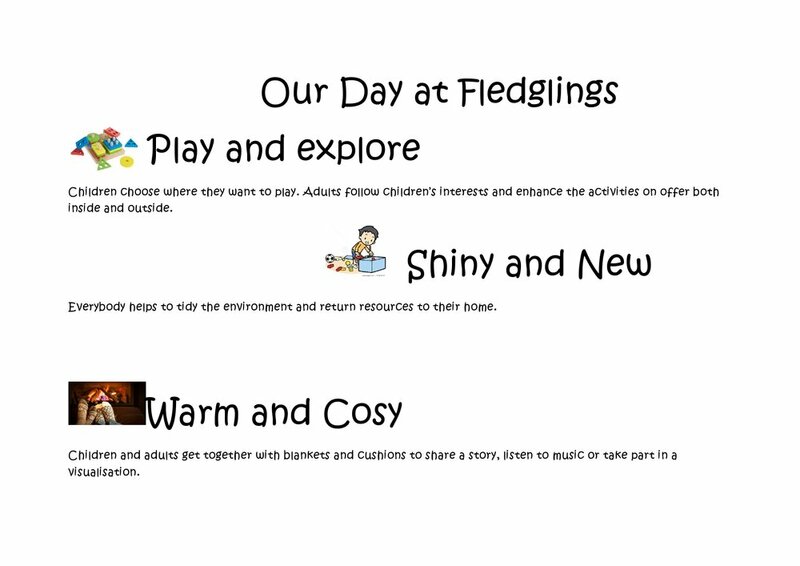 At Fledglings, we use Tapestry, the online learning journal, to collect photos, videos and observations of your child at nursery. We use this evidence, along with half termly narrative observations, to make termly assessments of each child. We encourage parents to log in to their child's journal and contribute photos and observations from home. This enables us to get a full picture of every child's abilities. Parent's are given Tapestry log in details upon registration. Use the button below to log in to your child's Tapestry journal.